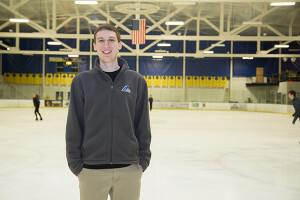 University of Delaware student Marc Rothman has always been interested in sports and statistics so when he saw an email from Tom Ilvento, professor in the Department of Applied Economics and Statistics, looking for students interested in doing statistics and analytics for the women’s ice hockey team, he jumped at the opportunity. 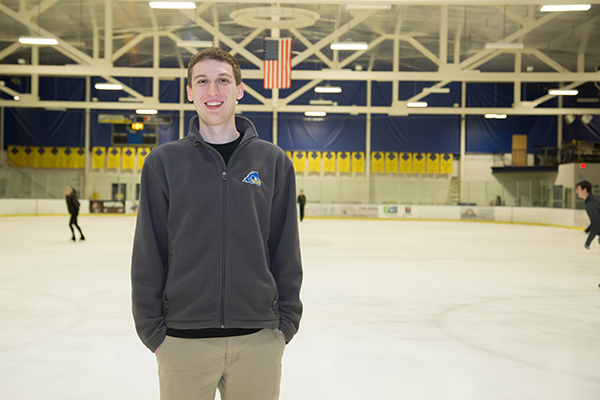 Rothman, a junior majoring in statistics and actuarial science, spent the last few months working as the director of analytics for the women’s ice hockey club team. He looked at statistics and trends that would help give the team an edge on its opponents. Rothman compiled all of the basic statistics — goals, assists and face-off win percentage — into an Excel spread sheet and said the biggest impact he had on the team was when it came to face-offs, as he helped them learn more about their face-off win percentage. The team was 7-14 last year and this year, with Jesse McNulty taking over as head coach, they finished the season 12-4-1. Rothman said McNulty told him that the team’s adjustments based on his data analysis is the major reason that the team improved their record. Rothman said he is very appreciative of the opportunity and all the support McNulty has given him, as it has led to other opportunities beyond hockey. One such opportunity involved an analysis of ticket sales for the Wilmington Blue Rocks minor league baseball team, considering how promotional games and weather affect sales. He also looked at monthly and day-to-day statistics for the past three years. “I looked at that data with a statistical program called JMP and I was able to graph the results and send it to the coach. He and his high school sports analytics club are presenting it to the general manager of the Blue Rocks in a few weeks,” said Rothman. “That is one great thing about McNulty, he opened up a lot of opportunities.” Basketball scouting reports In addition to the women’s ice hockey team, Rothman also worked with the UD varsity men’s basketball team. He compiled scouting reports on UD opponents prior to games, using statistics collected from websites such as Sports-Reference.com, as well as watching the other teams play. Rothman said that college basketball has a wealth of statistical information available online, which helped him spot trends for certain players. “There are websites that have all of these players’ game logs, so what I mostly do in my scouting reports for the team is look at the opponents and look at their trends. I look at stats but the really interesting analytics are trends — like when someone gets the ball, whether they’re going to shoot without dribbling, or drive to the basket, or drive left or right. All of that data is available,” said Rothman. Rothman said that even though he loves statistics, he does not believe they can tell a person everything they need to know about what a player does on the court. He likes to look at the numbers first and then watch the games — or vice versa — to help him get a sense of how particular players play the game. He also stresses the importance of trends. “In sports like basketball and hockey, I think trends are very valuable, especially to add to stats like points per game and field goal percentage,” said Rothman. “What’s really great about the trends is that you can see it in the games but you can also put numbers to it to see what percentage of the time someone drives right or drives left, among other tendencies, and this helps make valuable conclusions. “You can understand basic trends from watching the game but putting numbers behind it to back it up is something you can go to the players and give them the information. I really like when numbers back up what I’m trying to argue.” Rothman, who grew up loving baseball statistics, said that he originally applied to colleges with the idea of majoring in business. When he took an Advanced Placement statistics class as a senior in high school and had to do a project analyzing NFL running backs and their statistics, however, he set his mind on a career in statistics. That idea was reaffirmed during a visit to the UD campus. “When I visited Delaware, I sat with Dr. Ilvento and talked to him for about an hour about statistics and what you can do with them and how it’s going to be the next big thing and about how all of these jobs are becoming available. That conversation really helped me decide to come to Delaware. I talk to Ilvento all the time about this stuff,” said Rothman. If there is one thing that he wants people to know about sports statistics and analytics, it’s that sports statisticians can be athletes themselves. “A lot of people think sports statistics are analyzed by people who never played sports or never knew anything about sports and they’re just trying to get into the sports world. That’s what Charles Barkley said a few weeks ago, and I completely disagree with that,” said Rothman. “I’m not saying statistics have to be the end all decision maker of sports but I think analytics really offer an additional tool and a really important additional tool at that. And I think you’re crazy if you don’t use analytics to some extent, whether it be statistics or trends.” Article by Adam Thomas Photo by Lindsay Yeager This article can also be viewed on UDaily.